A few days ago, a woman known as Britney shared a picture she took with Hawick Lau (劉愷威) on social media. When a netizen mentioned Hawick’s wife Yang Mi (楊冪) in a comment, Britney responded by saying that the couple have already been divorced for two years. Divorce speculations between Hawick and Yang Mi have been circulating for at least a year. On September 12th, Yang Mi’s 32nd birthday, Yang Mi shared a picture she took with friends on social media, but Hawick did not offer any comments nor give Yang Mi a birthday greeting. 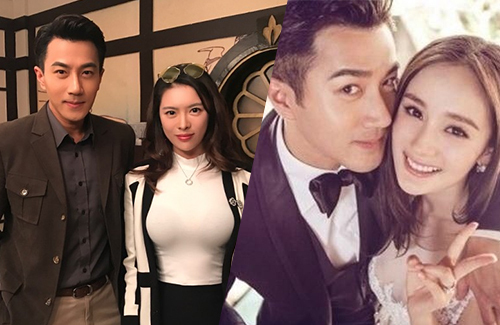 Yang Mi and Hawick’s interactions on social media have been minimal to none, and the couple have always stayed silent about divorce rumors when they were reached out for comment. It’s been said that the couple had to maintain a lovable image due to their joint endorsements. Okay, why doesn’t Hawick Lau sue her then? He and his agency, manager and lawyer should not just deny, deny, deny. Do something about it, or zip it. I remember the manager of a certain ‘god’ said that his and his wife’s neighbors were talking rubbish and tried to make the neighbors look like fools when they said they saw the great one and his wife on the patio. Turns out the neighbours were right. Actually, this is not the first ebiz couple I heard were divorced and still pretending to be married for business and monetary reasons. They don’t look cozy or friendly in the photo, in fact they look awkward, like 2 stranges coming together for a photo op. So i do think Hawick don’t know her, and for her to make such a bold statement about someone else’s marriage or divorce, she has no business doing so, unless she’s the GF.